Well, I didn’t get time to write a blog piece from Budapest. Here’s one the day after I got home, while the memories, emotions and the ‘flu bug I seem to have caught are still all fresh. Tuesday: 9am 60 metres heats, 9pm 60 metres semi-finals. Wednesday: 8am to 9pm photographing action on two tracks. Thursday: 10am 200 metres heats, 7pm 200 metres semi-finals. Friday: 9am to 9pm photographing the action again. Saturday: Another long day behind the lens. Sunday: 9am to 3pm photographing, then warm up and race in relay team. The astute readers amongst you will see there’s no mention there of 60 metres or 200 metres finals. Read on. Happy to say that I got to Budapest fit and well. Possibly in the best shape I’ve been in physically and emotionally since about 2010. However, I do regard my schedule at the Indoor championships as a one week recipe for guaranteed burn-out. This time was no different to Linz in 2006, or Clermont Ferrand in 2008, when I ended up victim to a ‘flu bug that is probably the inevitable consequence of mixing travel through airports with meeting friends and rivals from all over the world. Not going to have immunity to it all! I moved into the M60 age category in Masters Athletics the day before flying out to Budapest. That was the only advantage I could ever hope for! Nearly all the world’s best in my events were there. It was particularly good to see Tom Dickson from Canada again. He beat me to a bronze medal at the outdoor Worlds in Finland in 2009 by 2/100ths of a second. The first round of the 60 metres went well. There was no seeding for the first round heats. They were, in effect, time-trials, with the fastest 24 athletes going forward to the semi-finals. Not really an issue in 60 or 200 metres, where you’re flat out all the way anyhow. I was a fraction slow out of the blocks but ran my fastest since 2011. When the qualifying lists for the semis were posted, I was tenth fastest overall of the 45 or so competitors. With eight lanes on the sprint straight, a place in the final was possible, if I got my act together in the semi-final. I had a great semi-final. I can’t fault anything I did from a technical point of view. There were three semis, with first two from each, plus the two fastest other athletes overall going to the final. I was a close third in my race and thought I’d done enough to get through. The eventual results said not, however. I was ninth fastest overall and I missed my place in the final by just 7/100ths of a second. That’s about 20 centimetres in distance. Something similar happened at the World Indoors in 2008 and European Indoors in 2007, when I’d missed a place in the final by tiny fractions. Maybe even more galling in some ways was that a GB team-mate who qualified for the final pulled out injured at the last moment, but too late for me to be bumped up into the race. Almost a repeat of my experience in the European Championships in 2010 when a Russian did that to me! After this, I was pretty focussed when the 200 metres heats arrived. The job was clear, if not actually all that easy. I had the outside lane – Lane 6, I had Tom Dickson in my race, and I needed to hit this race hard. I got second place behind Tom, and 8th fastest overall going into the semis. History was repeating itself. I needed to be in the top six from the evening’s semi-finals to get into the final (only 6 lanes in 200 metres). It might just be on! I rested up in the hotel most of the day, and was in a very determined bubble by the evening. I got a great lane draw, and ran my socks off. It was my fastest 200 metres indoors since 2011, and I was third in the race. Mine was the first semi-final of three. Once again I’d be waiting to see if my time was good enough. The second semi was slower, and my hopes rose. The third race ran, and the scoreboard showed the Slovenian in third place in it to have run a time identical to mine! Someone shouted to me that I’d qualified for the final. Five minutes later, the truth came out: the timekeepers had to resort to looking at the photo-finish times to thousandths of a second, and I had been beaten to a final place by 5/1000ths. About two centimetres in distance. I got over it. I can take being seventh and ninth in the world in my two events! Mind you, when Sunday came, I was more than ever determined to run a good leg in the 4×200 metres relay. I knew by now I’d got the beginnings of a cold-type bug, and worried that I didn’t have a fast 200 metres left in my legs. The borderline between peak fitness and the onset of illness can be a razor’s edge at time. I was also feeling extremely emotional. The stadium PA played Cyndi Lauper’s “Time After Time”, and for some reason, I thought of my mother, who died in 2011, and what she’d have made of her 60 year old son racing in a World Championships. I admit that I had to find a quiet corner for a few moments to compose myself after that. I ran the first leg of the relay. No tactics, just an eyeballs-out 200 metres. My trademark this week! I ran well. The other three guys in Team GB ran well, but the USA squad ran better, and we took silver. No fun and games with times on this occasion. We were medallists! As you can imagine, it meant a lot to me. Subsequent investigation suggests our relay time was a new British M60 age record, too. 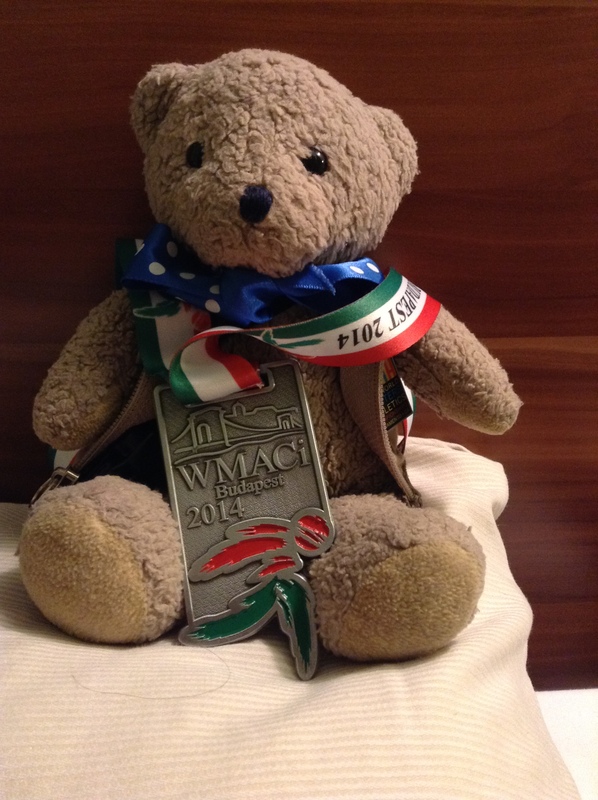 I’m home now, with bronchitis and a silver medal, letting all the events of the last week sink in! You are currently browsing the Blog from a Faster Master blog archives for April, 2014.